Though the Triple-Driver in-ears are still a way better value, the Quad-Drivers improve upon many of their design flaws and sound a little better. If you're not into accuracy, it's hard to recommend these. That said, if you want to hear your music with little embellishment, these live up to the Etymotic legacy. If you want some decent bass but still want your music to sound good, then definitely check these out. If you're looking to get the absolute most out of each penny spent on a set of wireless earbuds, the SoundPeats Engine should be top on your list. The headphone jack may be under attack, but earbuds are still one of those useful things you can carry in your pockets. Whether you’re living the dongle life or not, it’s hard to beat the sound quality of a good pair of ‘buds you can just toss in your pocket and go about your day with. The best earbuds not only offer good sound quality but are also comfortable and durable enough to use every day. Now to be fair, in-ears can cost thousands of dollars and sound amazing, but you don’t have to spend that much to get good quality sound. Case in point: the 1More Quad Driver in-ears which are some of the best earbuds you can get. Editor’s note: this post was updated on March 21st, 2019, to include new picks and price updates. If you couldn’t tell by the name these contain four different drivers in each earbud, each tuned specifically to handle a different frequency range. This means there’s less overlap between different sounds, as there isn’t just a single driver trying to do everything at once. And sure, at roughly $199 these aren’t cheap, but if you compare them to other quad-driver in-ears on the market: you’re still saving a ton of money by opting for these. And that cut in price doesn’t come with any drastic sacrifices either. You’ll still get the same top-notch quality that was available in the previous Triple-Driver in-ears with an all-metal housing and Kevlar cable. Speaking of which the Triple-Drivers make a great pair of ‘buds too if you want to save some cash, but if you’re looking for the best, the Quad-Driver’s are the way to go. They have a more ergonomic control module that’s compatible with Android or iOS. The sound signature consists of a slight bump in bass when compared to the previous model. Though the sound quality definitely favors the low-end, it’s not an overbearing experience. They keep the fun sound that many of us like without overdoing it—or forgetting about the mids and the highs. The treble, in particular, has good detail but they do get kind of harsh at high volume. Luckily they also get pretty loud, so don’t crank them up too often if you want to avoid noise-induced hearing loss. Looking for a sleek design with good sound? It’s rare that you find a product whose form perfectly matches its function, but that’s exactly the category that the Master & Dynamic ME05 in-ears fall into. The brass earbuds result in a slightly heavier pair of ‘buds but that doesn’t really matter once you put them in. They feel super light in the ears and if you add your favorite pair of ear tips for an even more secure fit, you shouldn’t have any problems. The brass build doesn’t only mean that you’ll get a durable pair of headphones that can handle a beating, but the metal also has specific properties that help sound quality as well. There’s a reason so many wind instruments are made of brass. These sound as good as they look, thanks to 8mm titanium-coated drivers in each earbud. So, if you’re a sucker for good design and premium build, you can’t go wrong with these as some of the best earbuds available. If you’re going to be monitoring or mixing (or doing any kind of professional work really) with audio, a pair of in-ears with a flat response might be a worthy investment to make. And if you want accuracy, look no further than the Etymotic ER4SR in-ears. These have a thin, smooth aluminum housing and triple flange ear tips so you can be confident that they won’t fall out. The minimalist design doesn’t allow any room for playback controls, but we’ll get these a pass. After all, these are specifically for professionals that work with audio, or anyone who doesn’t like to have emphasis on certain aspects of the frequency range. The cable is braided for extra durability. Though because the earbuds connect via MMCX connectors, you don’t have to worry too much about breaking the cable because you can just get another one. It’s worth mentioning that, even though these end in a 3.5mm plug (which your phone may or may not have now), they also have an impedance of 45ohm, so while you don’t need an amp for these if you already have one it won’t hurt. We all know someone that doesn’t care about sound quality and just wants bass, and if that person is you then hey, no judgment here! But rather than wasting your money on a flimsy pair of urBeats, why not at least get something that has a lot of bass and also sounds good? Beyerdynamic is a company that’s known for bringing great sound to lower price points, and they’ve done just that with the Soul Byrd earbuds. For less than $100, you can get a nicely built pair of earbuds that are comfortable to wear and rarely (if ever) get tangled up. There’s really nothing extraordinary about these earbuds, and that’s a good thing. They’re just a solid, good ‘ol fashioned pair of wired earbuds that you can wrap up and stuff in your pocket in a pinch. It’s worth mentioning that in our full review, we had some issues getting the microphone to work properly and they’re also not able to access your phones personal assistants like Google or Siri, but if neither of those issues is a big deal to you then you might be the person these are for. The Beyerdynamic Soul Byrd earbuds feature a good amount of emphasis on the bass notes that surprisingly don’t mask some of the other elements in the song in the same way that other, let’s say, lesser-experienced brands might. They also come with a few silicone ear tips to help you get the best fit possible but pro tip, you might want to swap them out with a pair of Comply memory foam tips in order to get some of the best isolation on the market (save for getting an actual pair of in-ears). Whether you’re going to be jamming out to your favorite tunes or just enjoying some podcasts (like ours), these make a great companion. If you haven’t heard of SoundPeats, no worries. It’s a relatively unknown brand but is successful in the “cheap earbud” category. The SoundPeats Engine is an incredible bargain; these earbuds provide aptX and aptX LL support. Plus, they come with Bluetooth 5.0 to boot. What’s more, if you’re one for working out in neckband earbuds, these are a viable option as they’re IPX6 rated. As far as build quality is concerned, these are predominantly plastic earbuds with a flexible, rubberized neckband. The housings are magnetic and conain two dynamic drivers to divvy up responsibility for frequency reproduction. Angled nozzles protruding from said housings allow for a comfortable listening experience. Although it’s a bummer that these charge via micro-USB, they provide a solid 12.73 hours of playback. When listening with these earbuds, it’s obvious that they don’t reproduce a neutral frequency response but that’s okay. It’s pleasing for the general consumer since bass and treble are both emphasized. For jusut shy of $30, it’s hard to recommend a better value. The earbuds themselves are small, made of aluminum, and pack a punch. KZ ATE copper in-ears: If you’re not looking to spend too much but prioritize sound quality over all else, then these might do it for you. The Kz ATE Copper in-ears are not going to outperform your favorite pair of expensive ‘buds, but for less than $20, they’re good enough. This means that you can leave your expensive headphones at home. Better yet, just leave these in your bag for when you forget your main pair and know that you have something solid to fall back on. Shure SE-215-K: Shure makes plenty of audio equipment, but the Shure SE-215-K ‘buds just might be a classic. RHA MA390: The RHA MA390 formerly reigned as the best bang for your buck option. They still stand as an excellent pair of affordable wired earbuds with a sophisticated design. Thinksound ts03+: If you want solid low end and a unique wooden pair of ‘buds, then look no further. What if you don’t have a headphone jack anymore? Unfortunately, more and more phones are ditching the standard headphone jack in favor of USB-C. Besides not being able to charge and play music at the same time, this also means that your options are fairly limited if you want a good pair of earbuds to use every day. Of course, you could always use any of the earbuds on this list with a dongle, but if dongles aren’t your style then don’t worry. We have a list of the best USB-C earbuds you can get so make sure to check that out if none of these piqued your interest. The 1More Quad-Driver In-Ear are the best earbuds you can get. Chances are you’ve been using earbuds for years, but there are still things that you should be aware of when making a purchase decision. First and foremost: safety. Though we usually say you should try and get your hands on a pair of headphones to try for yourself before buying, it’s a little harder with in-ears. You don’t want to be going to local electronics and just sticking things in your ears. Who knows who’s tried them out before you. It’s kind of gross if you think about it too much, but there are also infections that can be passed along that way. So, while it’s usually okay to go trying out over-ear headphones, you should take some precautions when it comes to in-ears like alcohol swabs or even your own pair of ear tips. Which brings us to the next thing that you should know when buying a pair of ‘buds: fit. Isolation is extremely important when it comes to enjoying your music and in-ears don’t have the luxury of large cups and leather to block out sound. If the earbud tip isn’t a good fit, you’re not only going to have a hard time keeping them from falling out of your ear, but you’re going to be letting in all kinds of outside noise. Luckily, earbuds usually come with a few different options so you can mix and match until you get the perfect fit, but one thing I’ve learned in my experience is just to invest in a good set of comply memory foam tips for yourself. Not only are they super comfortable and keep the ‘buds in your ears, they also do a solid job of blocking outside noise. This is of course not possible with true in-ears like the Etymotic ER4SR, but those also don’t have this problem because of how far into your ears they sit. No matter how good the best earbuds sound, if you don’t have a proper fit it’s all for not. One thing about wired earbuds that gets overlooked is just how damn good sound quality is. Sure, Bluetooth is more convenient and has plenty of benefits but dollar-for-dollar, some of the best earbuds blow away their wireless competition. Bluetooth sound quality is OK, and there are plenty of options out there—but wired headphones aren’t limited by data transfer speeds in the same way that Bluetooth ones are. Plus if you happen to keep your source files on the device, it’s actually not limited by data transfer speeds at all. Unfortunately, we as humans don’t hear perfectly. The typical human range of hearing is 20Hz – 20kHzm but depending on your age or how often you’ve been subjected to loud noises (like going to concerts), you might not be able to hear everything in that range. There really isn’t any way to avoid this as we’re surrounded by loud noises and are aging by the minute, but you can prevent the worst of it. Lily wearing a pair of true wireless earbuds. If the damage is done there’s nothing that can currently undo it. On the bright side, you can learn more about how hearing loss occurs by reading our explainer piece, and we also have a basic hearing test you can take to find out just how good your hearing is. If you’re like me and didn’t do as well as you’d like to, the good news is that you can still take care of your remaining hearing by limited volume to under 85 dB. That’s the recommended limit for safe-listening, and because earbuds are much closer to your ears than the speakers at a concert it’s even more important to keep that limit in mind. Disclaimer: Regardless of what we put on this list, we definitely missed some great options. That isn’t because we decided to ignore them, but because there are hundreds of great ‘buds out there. Picking five came down to a few main things. First was affordability. You can go deep down the rabbit hole when it comes to in-ear headphones. These end in a 3.5mm connector, so you’ll need to use a stupid dongle on new phones. Spending hundreds of dollars on a pair of ‘buds isn’t an easy decision and we don’t take it lightly, but when the alternative is spending thousands on insanely high-end IEMs we consider these relatively affordable. At the same time, you’ll eventually get to a point of diminishing return. 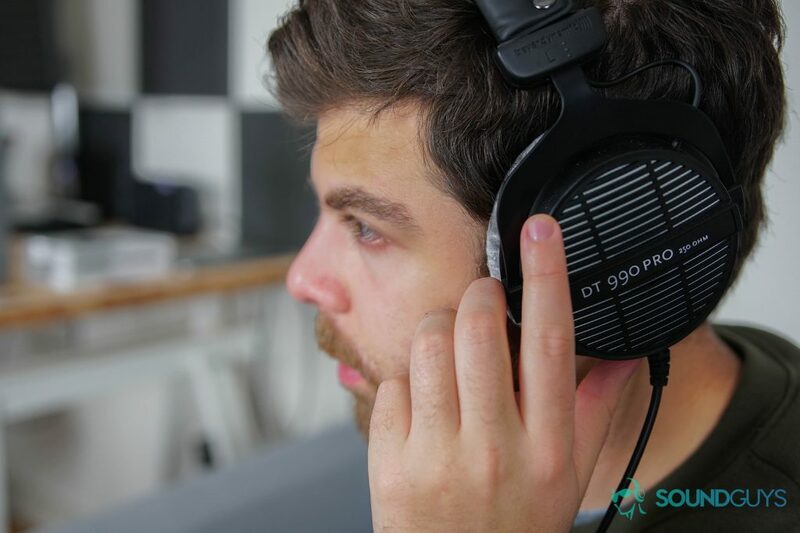 It’s true you’ll find some amazing headphones if you spend upwards of $1,000, but are they really $800 better than our top pick? We don’t think so. After price, the most important feature quickly becomes sound quality. Luckily, there are plenty of options here. Unlike Bluetooth headphones, in-ears are all about the hardware rather than software. And companies have had decades to fine-tune the sound for the best experience, resulting in plenty of great sounding ‘buds that won’t cost you too much. Comfort is important too, but there’s a lot of variability there. Not all of our observations are going to hold true for everyone. Consequently, we didn’t spend a ton of time waxing poetic about this feature, because your experiences will differ from ours; you have different ears, after all! Additionally, there remain some third party foam tip options for you to consider—offering even better isolation and fit than the standard silicone tips. Good ear tips will make even the best earbuds sound even better. We’ve tested just about everything—even if there isn’t a review up. The team at SoundGuys come from all walks of life, but they involve audio. Chris spent years testing products for the likes of USA Today and Reviewed.com. Lily also spent years reviewing headphones independently on her own time before joining the team, as well as working in and out of radio stations where she was surrounded by equipment. Adam has been a SoundGuy for almost four years now and has tried or listened to most of the major products to come out in that time. Robert holds a BSc (Hons) in Sound Engineering and has years of experience repairing, building, and testing all manner of audio gear. Add all that together, we just might know what we’re talking about.